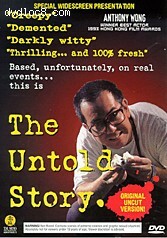 This page contains easter eggs for the disc Untold Story (DVD, Region Free). Select the entry 'Appetizer' in the disc's main menu and then press your Left button. This will take you to a different screen where a Fortune Cookie will predict your future. Tai Seng have included a number of different fortunes, so go ahead and try it a few times.